Our spacious (1400 sq. ft.) luxurious third floor condominium has been completely remodeled and professionally decorated!! 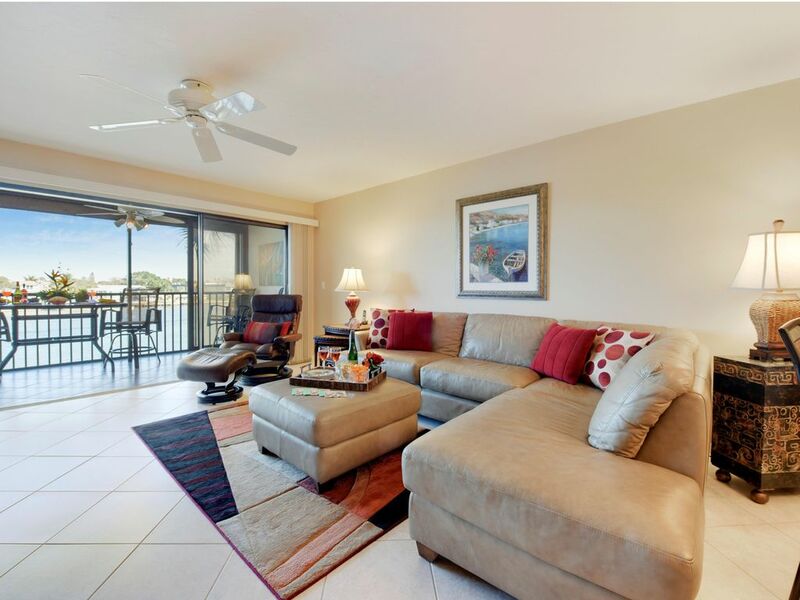 This top floor condominium has a spectacular view of the Intracoastal Waterway from the living room, dining area, kitchen, master bedroom and 18' screened lanai with sliding glass doors. Access to our Non-Smoking unit is by a private stairway. You can stroll to Siesta Key's famous white sand Crescent Beach (Picked as America's Best Beach by Dr. Beach) via a private walkway located just across the street. Fish or boat in the private lagoon. Swim in the heated pool located next to the clubhouse, enjoy a game of tennis on the on site courts, or just wander the beautifully landscaped 14 acre complex. Our unit is air conditioned and also has ceiling fans in every room. The living room features a Genuine Ekornes Stressless leather recliner and leather sectional with ottoman,plus 50' HD Smart TV, DVR for your viewing enjoyment, DVD/Blue Ray Player, and stereo with CD player. The master bedroom has a NEW king-sized bed, full bathroom with walk-in shower, separate dressing area with walk-in closet, and 32' flat-screen cable TV. It also has a new Dell Computer for your use, with Comcast hi-speed wireless Router/Modem, plus Canon Printer/Copier/Fax/Scanner. WE PROVIDE FREE Comcast Local and Long-Distance calling to US, Canada and Puerto Rico!! The guest bedroom has twin beds, large closet, flat screen 19' cable TV, and completely remodeled bathroom. All necessary linens are provided, and a full-sized washer and dryer are in the unit. Our chef’s kitchen is fully equipped, and provides features which include a built-in glass cook top, built-in oven/microwave, chef’s cutlery, Kitchen-Aid stand mixer, and all the cookware and dishes you would need to prepare a gourmet meal. Housekeeping is provided at the conclusion of your stay, so you don't have to do any heavy cleaning as your visit is coming to an end. Supplementary housekeeping services are available for an additional fee. Shopping and restaurants are within easy walking distance. Public transportation is available nearby for more distant exploration. Sarasota has world-renowned shopping, fine dining and cultural attractions, and is located within easy driving distance of the most famous tourist destinations in Florida. You have waterfront dining for every meal on our comfortable waterside lanai. Watch the parade of boats each day and keep an eye out for dolphins and the occasional manatee. We provide a Dell computer with 23- inch computer/monitor connected to Comcast high speed internet for your use, with printer/copier/fax. We are also equipped for high-speed wireless connection for your equipment. Master Bath has walk in shower. Separate Dressing area with walk-in closet in Master Suite. Midnight Cove II is proud of our Fitness Center! We have had commercial equipment that includes weight training machine, elliptical trainer & treadmill. Living room with sectional leather sofa, Ekornes Stressless Recliner. Brand new 50' Vizio Smart TV! Bring your favorite K-Cup for our Keurig One-Cup. We also have a Cuisinart 10 Cup Drip & French Press coffee makers. All provided. Service for 12. Large Observation Deck Located directly on Intra-Coastal Waterway. Newly remodeled pool deck with shaded seating areas available. THIS IS A NON SMOKING UNIT! 3 Flat Screen TV's, Keyless Entry, UNLIMITED LONG DISTANCE TO US, CANADA AND PUERTO RICO. All Linens, Beach Towels, Beach Chairs, Coolers, Answering Machine, Portable Phone Provided. SORRY, NO PETS!! NO SMOKING!! This is the second time that we were fortunate enough to spend time in this lovely, totally stocked, comfortable condo in Siesta Key. The views of the inter coastal waterway from the lanai are amazing. Just a short walk to the private beach. Everything you could possibly need is right at your fingertips.